Ballard is so consistent! In over forty years of interviews his preoccupations remain broadly similar – while genres and styles change (non-linear narratives coalesce into linear ones, the short story falls away and the novel prevails) a few dominant themes and images develop and nag at the reading world. In one of his last interviews Ballard concedes that his attitudes may have swung a little to the left in response to the wealth divisions in noughties' UK (this is someone who in these interviews expresses some admiration for Margaret Thatcher, an obsessive love of the internal combustion engine and gratitude to Mutually Assured Destruction), but this realignment seems to have had little effect on his preoccupations which do not sit comfortably across or along the lines of such politics. Ballard mined literature and the act of writing to find that which might explain the world he saw and felt. He describes how he broke from the technological optimism of US scifi (like George Steiner, Ballard notes how little the Apollo moon landings engaged art and culture) as much through the process of writing - “I found that the action and events... were breaking down as I wrote them” as historical conviction. He took the landscapes of scifi inside: “the only external landscapes which have any meaning are those which are reflected in the nervous system” and he developed a mythogeography of the spectacle: “[T]he immense terraced figure of Marilyn Monroe stretched across a cinema hoarding... as real a portion of our external landscape as any system of mountains or lakes”. Ballard saw everyday life as fictional, spectacular, a “media landscape” devised by advertising executives in which “[T]he greatest fictional characters are people like the Kennedys” and “science is a fiction invented by scientists”. There is something of Charles Fort there and more of Guy Debord, and yet Ballard seems to have been deeply affected by the surrealists and then by not much else other than his own observations. Instead, everyone has been catching up with him: by the early 70s apps, www and virtuality were all already taken as read by Ballard. What does grate with this consistent vision is a kind of hope. In his 2006 interview, Simon Sellars surprises and delights Ballard into a detailed attribution of his work to affirmation: “to making something positive out of the chaos... to create some sort of positive mythology that can sustain one’s confidence in the world”. This connects to previous geo-narratives of Ballard’s: “we’re moving into a realm where... everybody will be upper-class, everybody will be rich... I think the future is going to be like Las Vegas, one enormous jukebox playing some very strange tunes. But it won’t be doomsday to the people living there.” “[I]t’s going to be a country-club paradise” in which “‘replicas’... are far more seaworthy than their originals” and “the only freedom to be found is in madness”. While there may be something to Ballard’s noting of the failure to address wealth and affluence rather than division and inequality as a politics, there is also a terrible and necessary partiality here. His commitment to the sheen of the motor car and the reflections in it distracts him from its motor and fuel. The spectacle is not simply a giant narrative or projection; it is also a set of relations. What Ballard does is write its dreams in the surreal sense of their inner/better reality. What this book of his interviews does is to make that mechanics overt. 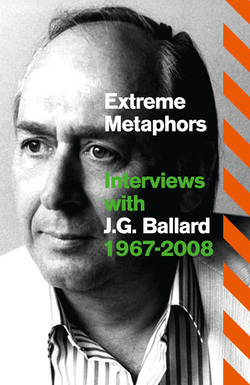 By editorial choices, brief introductory directions to each interview and juxtapositions, Extreme Metaphors maps out a floating world of images and their producers, charting how Ballard’s partiality allowed him to float free where he ‘should not’ and divine the relations of images and illusions and the pathology of their makers and purveyors trapped in landscapes denuded of social relations by flood, drought, speed, leisure or architecture.